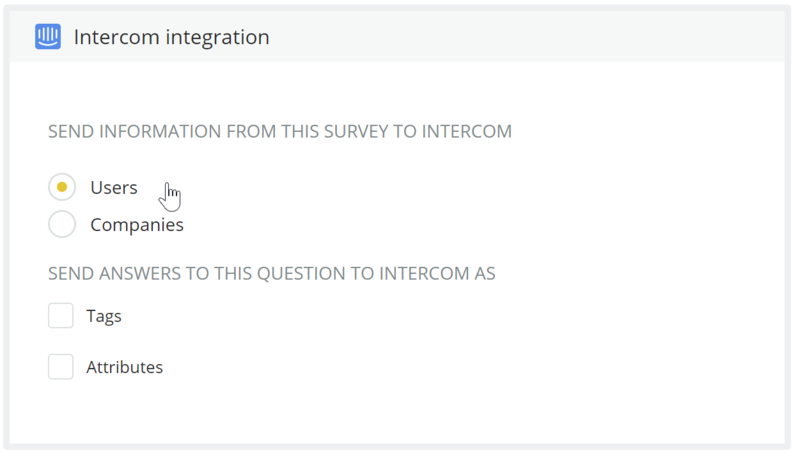 What do you get from Intercom Integration and how to set it up. 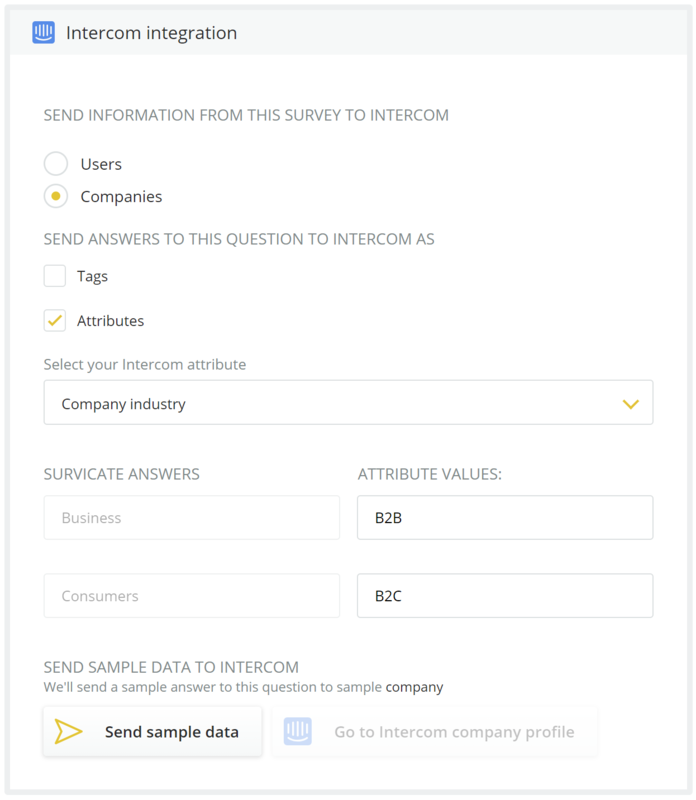 Uncover your active users' insights by surveying them in an unobtrusive, contextual way with in-app surveys. Research Net Promoter Score (NPS) in your app as well as send them via Messages and Smart Campaigns, and act upon scores with follow-up emails to prevent churn or boost referrals. 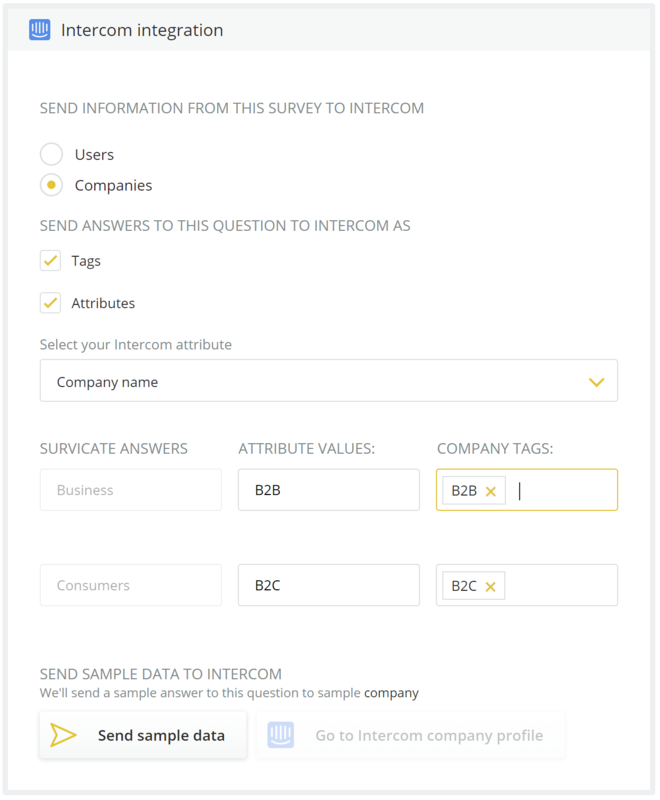 Send basically any survey to your users and leads via email or chat messages to segment them better - associate responses with users and send them to Intercom as user / company attributes, tags and events. 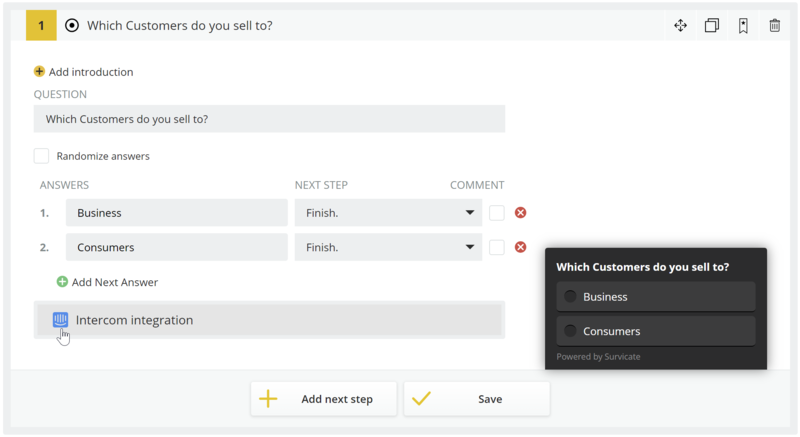 Pick Integrations from Settings section (top-right corner) or 'chain' icon on the left-hand side menu of your dashboard. 2. 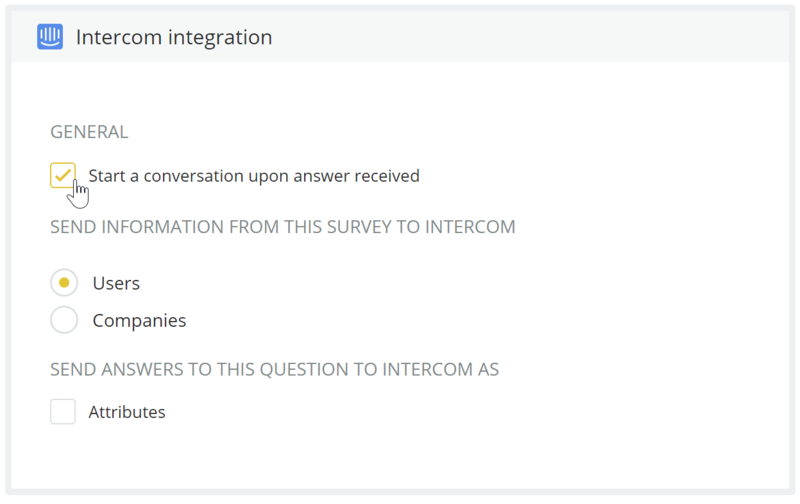 Find Intercom logo and click Authorize. 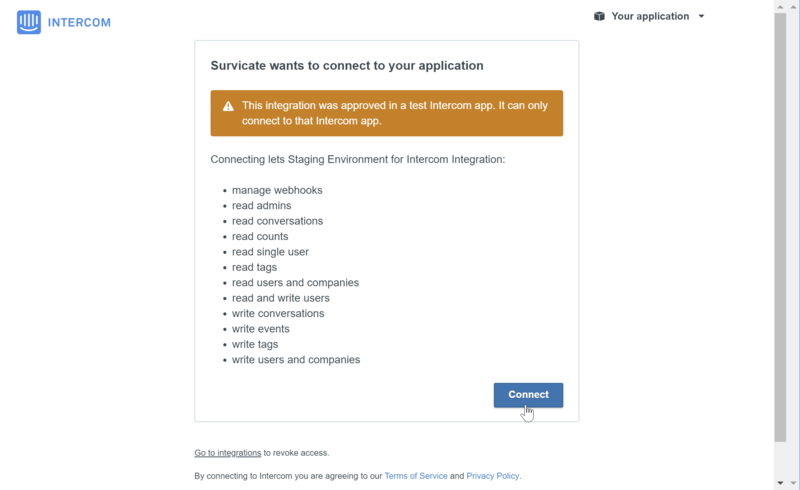 🔒 Survicate uses OAuth to authorize with Intercom so you can be sure we don’t send anything unnecessary. 3. Press Connect button to confirm connection in the pop-up window. ❗❗❗ If you don't see the pop-up window, you may need to allow pop-ups in your browser - please look for the settings in your browser URL bar, or use instructions for Chrome, Firefox, Opera, Edge, or Safari. ❗❗❗ But - yes, there is a small 'but' - in order to run surveys in-app, you need to have Survicate tracking code installed as well. 🔧 You can find your tracking code and instructions by clicking Settings (top-right corner) and then Tracking code. If you're not sure how to proceed, there's an option to send it straight to your developer. This should not be a hassle and could take literally few minutes/clicks to finish. More on than here. 📧 It's not necessary for email surveys and embeding surveys in chat messages. 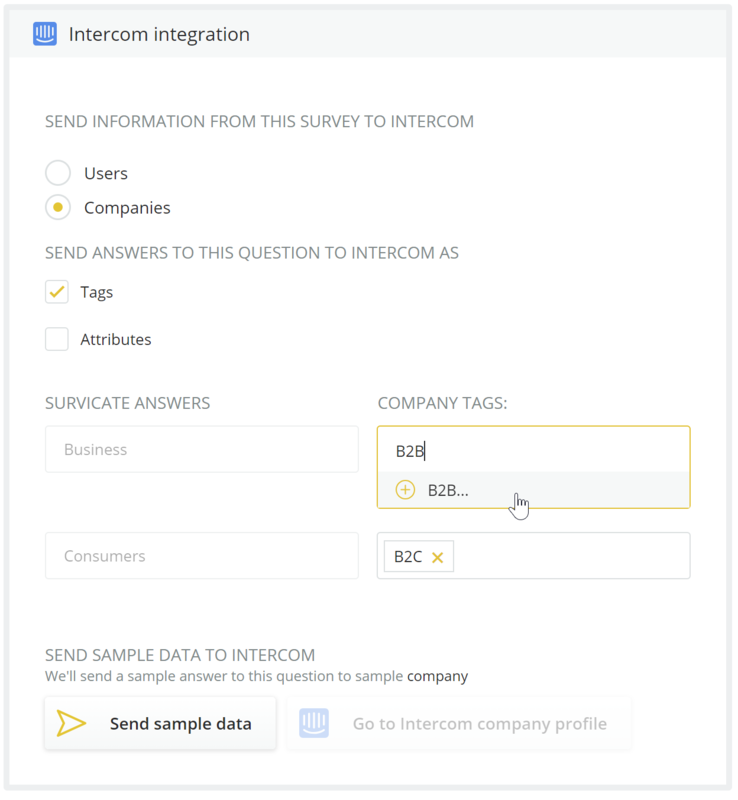 After you choose an attribute, we will be able to send data to Intercom. By default Survicate is sending content of an answer as attribute value, but you can change the label to make it shorter or to fit your data structure - use attribute values field as below.